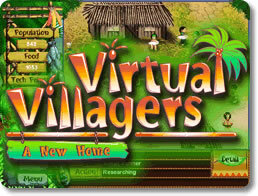 Virtual Villagers: A New Home Game Review - Download and Play Free Version! The Sims meets Gilligan's Island! Fans of "The Sims", Check This Out! Trapped on a deserted island! Virtual Villagers is about a group of desperate people that have survived a catastrophic natural disaster and must learn to survive on the island of Isola. Teach them to farm, research new technologies, build new living quarters, and have children to grow the village. Guide the day-to-day lives of these villagers and help them explore and restore their new home. As your village grows and prospers, your villagers become curious about their mysterious new island home and the secrets it holds. As your villagers grow in their skills, they will be able to do new things like remove the boulder to a secret cave and understand some of the mysterious plants on the island. Discover and solve these puzzle "milestones" by gaining experience in farming, research, breeding, building etc. and unlocking new technologies. You never know what is hidden on the island and discovering new things is a whole lot of fun. Just like Fish Tycoon from the same game developer, Virtual Villagers take place in real time meaning when you shut off the game, the villagers are still working and growing in their skills. You will need to check in with them now and then to make sure they are staying on task, nobody is sick, and you are advancing in your discoveries. This is a nice feature if you don't want to sit in front of a game for hours and hours at a time. If you are tired of the same old kind of game, Virtual Villagers will be a breath of fresh air and worth your time. Give a shot and download the free trial! Also, try the sequel, Virtual Villagers 2, that picks up where this game leaves off and the latest adventure Virtual Villagers 3! Once you have solved this mystery, there are more mysteries on the island of Isola to uncover! In Virtual Villagers 2, you find some children living on the island. Train these children to survive and grow and find out what kinds of secrets they might reveal! In Virtual Villagers 3, you discover the ruins of an ancient city. What could this possibly be about? Find out now! In Virtual Villagers: A New Home, you get to control the lives of your villagers and their children while you investigate the mysteries of your new home. You are responsible for building shelter, gathering food, researching new technology and much more. The villagers will have to learn skills to make the most of your island home. All this is going in real time, even when you aren't playing. You start the game with a brief story about a volcano erupting which is why you left your previous home. After you crash onto the new island Isola, you find a deserted village on the beach and you take up residence there. You start with six villagers in hard mode and seven in the other modes. You will need to tell your villagers to perform tasks like gather food, research and build. The longer a villager performs a task the better they get at it. The villagers will continue doing what you have told them to most of the time, but occasionally they will explore or eat. The other goal besides staying alive is exploration. There are several mysteries that you need to solve as well as things that will help your villagers out. Controlling the game is very simple and only requires the mouse. To start a villager on a certain action you hold down the left mouse button on them which will pick them up and drop them near the activity you want them to perform. Tech points and food are the only consumables in the game. Tech points are earned by scientists and can be used to upgrade things like construction, farming, fertility and even spirituality. Food is gathered or grown and feeds the villagers when they are hungry. The villagers will eventually age and die so you will need to continuously replenish the population with babies. Children won't work until a certain age, but they still consume food and resources. There is a total of 16 challenges to accomplish. Some of these are things you will accomplish by advancing in the game but some require you to explore and solve mysteries. 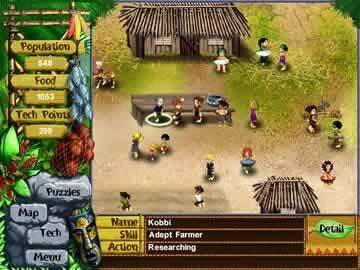 Overall Virtual Villagers is a great game that will entertain you for a long long time. Playing in short bursts means you won't have to spend all your time playing and having things progress while the game is off makes it interesting. Easy controls and a family friendly theme makes this game playable by anyone. With plenty of upgrades and mysteries this game is well worth the time. See how to interact with the villagers and get them to perform vital tasks to unlock the puzzles and mysteries of the island.